Speaking of the Holocaust, the German writer W.G. Sebald wrote, “no serious person ever thinks of anything else.” While the specifics of Sebald’s well-known aside may be up for debate, one thing is certain: much of contemporary Jewish life still exists in the overwhelming shadow of “that which happened.” Attempts at grappling with the theological void opened up in the wake of European Jewry’s annihilation are either ex post facto, written with the distance of a number of years, or instead draw upon the traditional library of Jewish theodicies. Rare indeed is the book known as Aish Kodesh, by now synonymous with its sainted author, the martyr Rabbi Kalonymus Kalmish Shapira of Piaseczno (1889-1943). Discovered after the war in a rusted milkcan, this precious sefer represents one of only a handful of Torah works composed amidst the cacophony of destruction. A collection of derashot (Torah homilies) delivered within the darkness of the Warsaw Ghetto, the result is one of the most important sustained engagements with the problem of evil and hester panim (when God conceals His presence) in Jewish history. Aish Kodesh has become a definitive document not only of Holocaust theology but of the Jewish response to suffering in general. Published from that hidden manuscript in 1960, and again in a slightly revised edition in 2007, the sefer witnessed a popularity that has grown along with a resurgence in scholarly interest in the figure of the Piaseczner Rebbe and his written ouevre. Much of this contemporary interest is due to teachers like Rabbi Moshe Weinberger, who named his synagogue in Woodmere, New York after the given title of the book. In his approbation to the book under review, Rabbi Weinberger testifies that Aish Kodesh has not left his desk in Aish Kodesh for forty years. One of the hallmarks of Aish Kodesh is the almost total lack of direct reference to the surrounding reality. In this respect it is sui generis, and the book retains an air of mystery alongside its mysticism, with the Rebbe refusing to name that which cannot be named. To be sure, oblique references to the daily horrors of ghetto life permeate nearly every sermon, often deftly tied to the weekly Torah portion or holiday. 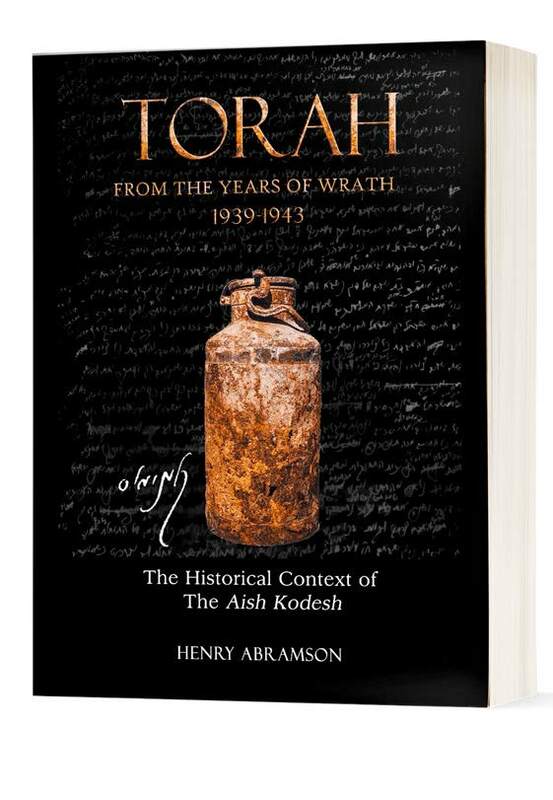 Dr. Henry Abramson, a historian and dean at Touro College, has entered that void; the result is a deeply engaging, enlightening and sometimes heartbreaking scholarly work that attempts to situate the Rebbe’s sermons in the historical context from which they were delivered. Through contemporary accounts of ghetto life from primary sources—the diary of Adam Czerniakow, head of the Warsaw Judenrat; the secret Ringelblum Oneg Shabbat Archives; and eyewitness testimony of survivors along with other historical data—Dr. Abramson is able to piece together the events that influenced the Rebbe’s Torah as originally delivered to those Jews in the ghetto, who would gather around for encouragement, inspiration and hope. A collection of derashot delivered within the darkness of the Warsaw Ghetto, the result is one of the most important sustained engagements with the problem of evil and hester panim in Jewish history. Dr. Abramson draws from the full range of available scholarship on the Piaseczner Rebbe, especially the groundbreaking work of Rabbi Dr. Daniel Reiser of Herzog Academic College, who recently published a two-volume “critical” edition of the sermons, correcting many errors that had crept into the text. In Dr. Abramson’s work, studies of the individual sermons, presented in chronological order, are sandwiched between a welcome overview of the Rebbe’s biography and prewar writings and a concluding chapter exploring the faith of the Rebbe himself. There are many reasons this work was slow to reach completion. Not the least of these was my difficulty in gazing at the awesome pain of that period for extended lengths of time . . . I must confess at this point my unbounded admiration for Rabbi Shapira’s achievement, for if I had difficulty confronting a topic at a remove of almost fifty years, what inner strength did it take to maintain a stable center and communicate a luminous vision of faith, while in the heart of darkness itself? The import of Dr. Abramson’s work is to bridge the gap of all those years, bringing us closer to the terrible tragedies and events that the Rebbe is responding to. Whereas previous study of Aish Kodesh was limited to the general idea that this Torah was communicated during the horrors of the Holocaust, we can now understand to varying degrees of terrifying specificity the exact nature of the “heart of darkness” within which the Rebbe is speaking. To a similar extent, we may also know what accounts for the gaps in the sermons that characterize Aish Kodesh as well. The result is very challenging, even painful, and one wonders if the Rebbe deliberately obscured these historical details, what value there is in uncovering them. In recreating the context of the sermons, not a single detail is overlooked. Dr. Abramson hones in on textual emendations, manuscript details, even changes in handwriting. Ultimately, two sefarim emerge: one abstract work of Chassidut composed with an eye toward the problem of evil called Aish Kodesh; and another, Torah from the Years of Wrath, revealing the immense spiritual heroism of a tzaddik and his Torah amidst the specific details of suffering in the Warsaw Ghetto between the years of 1939 and 1943. Finally, Dr. Abramson reveals that simply situating Aish Kodesh within the historical context of the Holocaust and the Warsaw Ghetto is insufficient. In the first four chapters analyzing the Piaseczner’s biography and prewar writings, Dr. Abramson also demonstrates that the true setting for the sermons that became the Rebbe’s name are those educational writings which evidence such boundless love for every Jew, especially children. 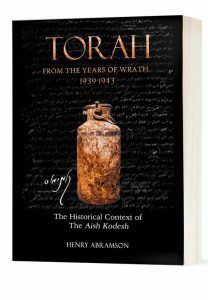 Together with the painstaking historical work, Torah from the Years of Wrath allows us to appreciate the Piaseczner and Aish Kodesh in a profound new way, an achievement so desperately vital as the living memory of the Holocaust begins to succumb to history. Rabbi Josh Rosenfeld, a musmach of the Rabbi Isaac Elchanan Theological Seminary, is the assistant rabbi at Lincoln Square Synagogue and serves on the Judaic studies faculty of SAR High School in Riverdale, New York.